Firefighters battle a petrochemical fire at the Intercontinental Terminals Company, March 18, 2019, in Deer Park, Texas. 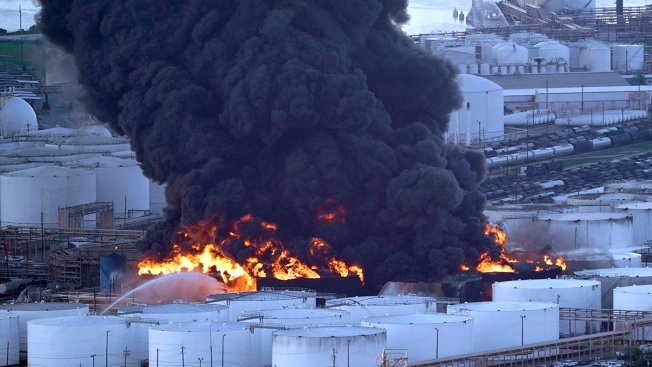 A Houston-area petrochemical storage company that was heavily damaged by fire has received hundreds of compensation claims from residents seeking lost wages and other damages, a company executive said Tuesday. Brent Weber, a senior vice president for Intercontinental Terminals Company, told reporters that about 2,000 people have called an ITC claims hotline and another 300 submitted claims in writing. He didn't specify how many callers to the hotline made a formal claim. Coast Guard Lt. Commander Caren Damon said a portion of the Houston Ship Channel remained closed Tuesday but that ships have navigated the restricted portion of the channel without a gas component tainting their hulls. She did not say when all of the commercial waterway will be reopened, explaining that the "channel will reopen when there's no visible product still in the water." The Deer Park facility caught fire March 17 and burned for days, sending waves of thick, black smoke thousands of feet into the air. Schools and roads were closed and gasoline and other materials seeped into nearby waters. Air monitors last Thursday detected elevated levels of benzene in the air, prompting public officials to order people living in the area to remain indoors. The next day, a dike failed adjacent to the tank farm, allowing flammable chemicals to seep into nearby bayous and then into the ship channel. The tanks at ITC contained components of gasoline and materials used in nail polish remover, glues and paint thinner. Harris County commissioners on Tuesday, in their first meeting since the fire, said they'll hold ITC accountable for the hazards unleashed by the blaze. They gave approvals for the county to sue ITC. Seven people who live near the storage facility earlier filed what was believed to be the first civil lawsuit against ITC over the fire. The suit was filed in state district court in Houston. The residents are asking for at least $1 million in damages, accusing ITC of negligence. They allege they suffered a variety of illnesses due to the fire and the release of chemicals into the air, including, bronchitis, pneumonia and itchy, burning eyes.